The Indian consumer electronics company will sell its smartphones and tablets in Russia from early February. Micromax has launched operations in Russia, a country which its co-founder Rahul Sharma considers as a “gateway to Europe.” The Gurgaon-based company, which has successfully entered the Bangladesh and Sri Lanka markets, sees bright prospects in Russia, a highly competitive market for smartphones dominated by Samsung, Nokia and Apple. Co-founder Rahul Sharma says Micromax wants to take “Russia by storm” and is aiming to capture more than 10 percent of the market in about three years. Industry analysts are sceptical about these ambitious targets. “Compared with the rivals, the prices of Micromax devices are fairly attractive, with comparable technical specifications,” says Maksim Kalyagin, an analyst with Finam, a capital management company. “But there is fierce competition in the bottom segment of the market.” Kalyagin reckons that the Indian brand can achieve long-term success only if its products can offer a good balance between price, quality and performance. Aleksandr Malis, president of the large Russian retailer Euroset, says that it is impossible to achieve quick success in the Russian market for mobile devices. “They can succeed only if they are prepared to invest in this market for several years,” he believes. “Take, for example, another Indian brand, Fly. They are fairly popular here in Russia, but it has taken them five years to get to where they are now." Managers at Svyaznoy, another large Russian retailer, say that success will require a combination of several factors, including effective logistics, a good distribution system, and a customer-friendly service infrastructure. Customer service still remains the Indian company’s weak point, according to Svyaznoy. 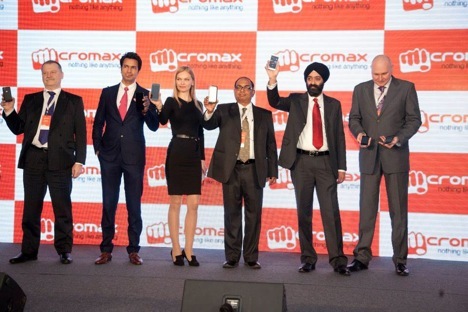 The entry of lesser-known brands such as Micromax on the Russian market for smartphones was one of the most obvious trends of 2013, analysts say. Handsets in the 5,000 roubles (about $150) price range have shown the fastest growth and now account for 33 percent of all sales, up 13 percent from 2012. Micromax aims to deliver cheap, well-made and stylish products. Its new flagship smartphone, the Canvas Turbo, will cost about 10,000 roubles (about $295), which is half the price of handsets with similar specifications offered by competitors. The phone will be launched simultaneously in Russia and India. Canvas Turbo is the flagship Micromax smartphone. Listed at $325 on the Micromax online store, this is the company’s most expensive device in this category. Its cheapest mobile phone costs only $58. VVP Group has been chosen as the exclusive Micromax distributor in Russia. The company had previously been a distributor for Nokia. Sales of Micromax devices will begin in Russia in early February via independent retail networks that have partnership deals with VVP. Given the distributor’s good record with Nokia, its cooperation with the Indian company also appears to have bright prospects. The Indian handset maker is also working closely with the Russian telecommunication giant MTS. “The beginning of our cooperation in Russia naturally follows from our cooperation in India,” says Elena Kouznetsova, Micromax’s chief manager for marketing.